Exposure to different environments and conversations can take you anywhere. The origin story for this shop profile began at animation artist presentation for the Cuphead video game at OCAD University in Toronto, Ont., last winter, where the designers and animators behind the visuals were speaking. 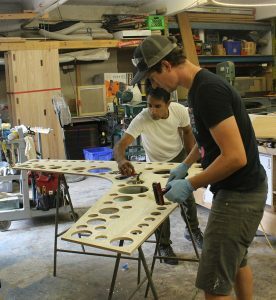 Morbi Design and Reain Custom Projects, Toronto, Ont. Ali Morbi of Morbi Design constructed sets for the hit Xbox One and PC game and demonstrated how he created these to the college crowd. Afterwards, it was clear this was a talented woodworker with more to say. Morbi, it turns out, has a close business associate, Alan Reain of Reain Custom Projects, who share a 1,200 square foot rented space in Toronto’s Junction Triangle neighbourhood. Their businesses have had different names since they bunked in together at the shop space in the spring of 2015, and still do — but that sounds like that could change in the not-too-distant future. Morbi calls Reain his partner. “We have two different companies but if I get a job that I need help on I hire Alan and vice versa,” Morbi says. Both agree that they’re thinking about forming one company. The two were looking separately for a shop to occupy and ended up finding each other on Kijiji, the social media goods and services platform. 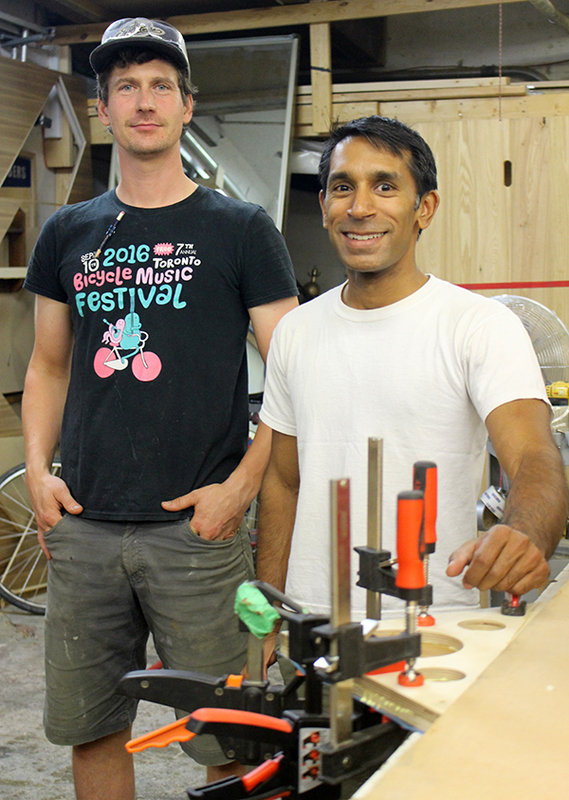 “It turns out that we work well together,” says Morbi. 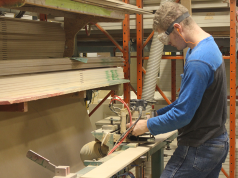 Reain’s immediate background comes from carpentry in the film industry. 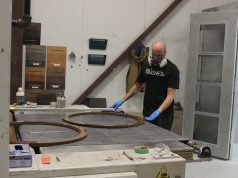 Prior to that he had some cabinet shop work, as well as general construction, renovation and custom home building experience. While he held an aerospace engineering degree, Reain felt frustrated by that discipline as an occupation. “It turns out that you don’t get to build anything actually with your own hands,” he laments. 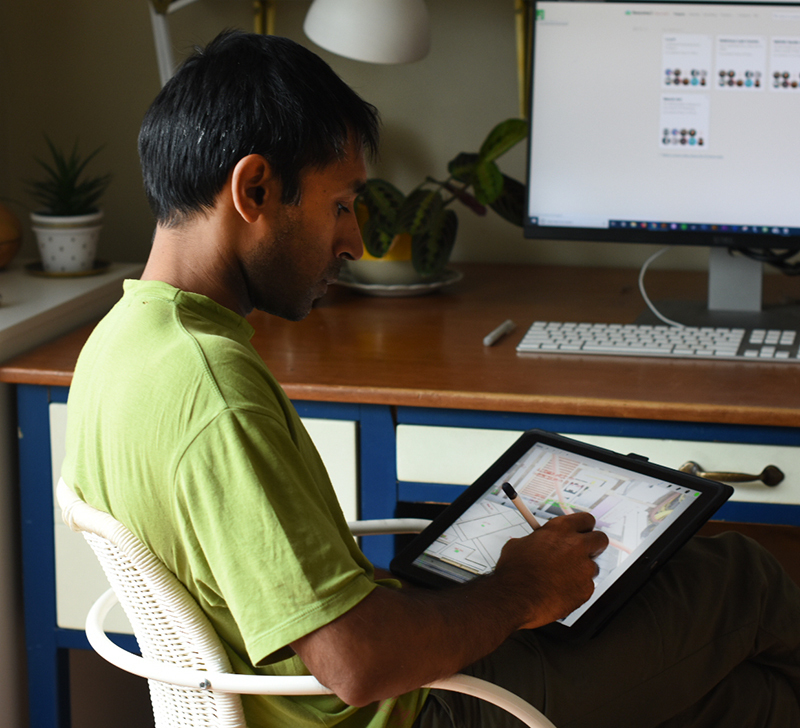 Morbi employs a tablet to communicate with clients at job sites and in the shop. 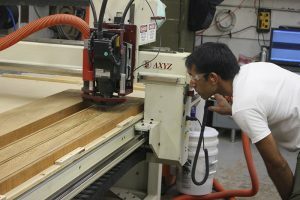 Primarily the CNC router is used to create cabinetry, but it also produces a moderate amount of metal work, along with three-dimensional prototyping for engineering firms and movie props. “Most guys use this thing to blast out cabinet parts,” says Morbi. 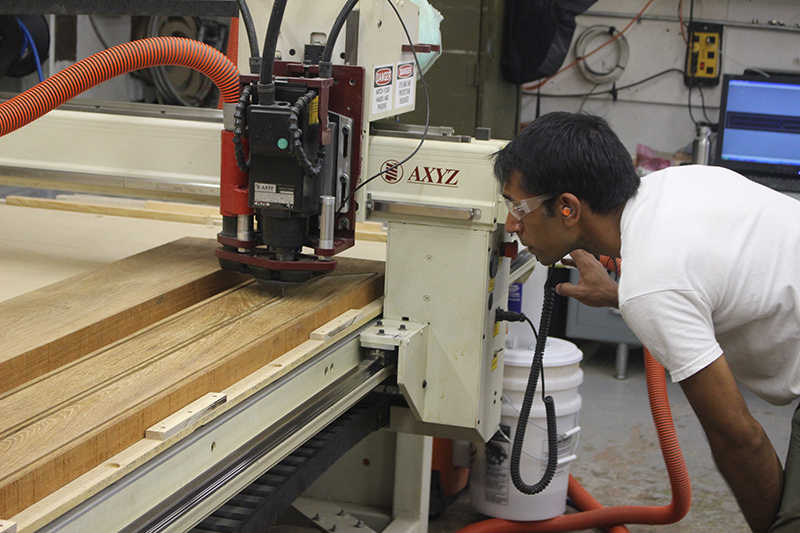 An Axyz CNC router helps provide Reain and Morbi a competitive edge. Because of Reain’s recent work experience, the two get a certain number of referrals from people in the film industry, as well as referrals from other clients they have done work for. “They mention it to their friends and co-workers and we end up with jobs that way,” says Morbi. The pair uses photos for efficient takeoffs. Morbi laughs and points out that shoddy work just leads to cheap customers looking to for the lowest price. A small shop may not turn over large, lucrative jobs, but an agile shop means that many customers can be served across a large variety of work. But being too agile can have its downside, such as when a project is accepted that others passed on. One architect was looking for help on a particularly complex job, says Reain. “I know at least one other builder and probably more who were asked in on that project. Frankly they were intimidated by it because it was a pretty tricky on-site-project. 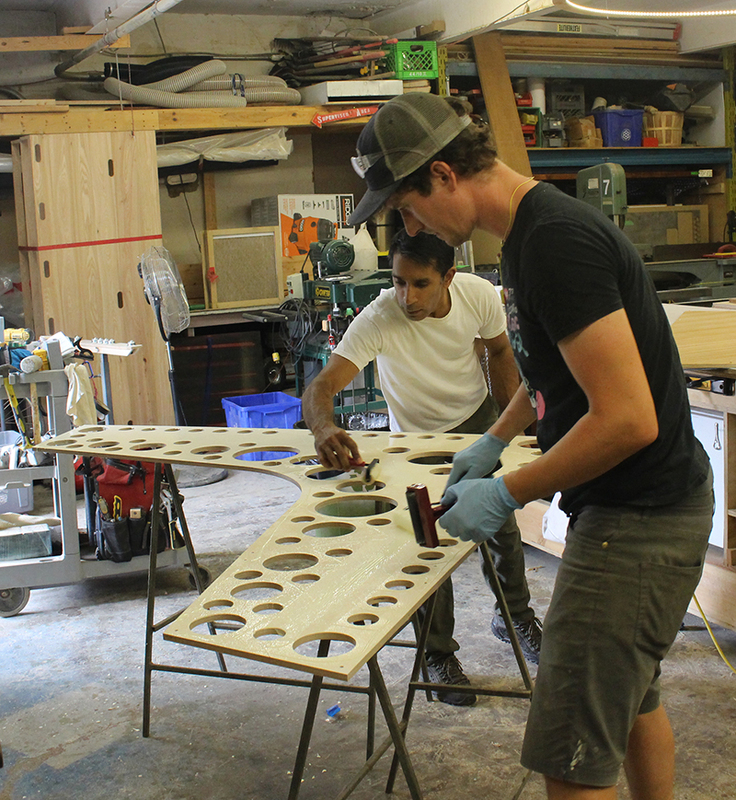 Gluing up a custom table for a film set. 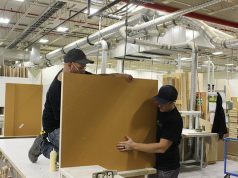 The two have combined agile, on-site build capabilities paired with flexible, on-site consultation skills. As an example, on one project, they wrapped the centre column of a client’s split-level house in white oak. 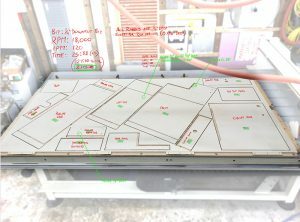 They had to cut it in around existing stairs that were pre-installed, so it involved some CNC machining, according to Reain. 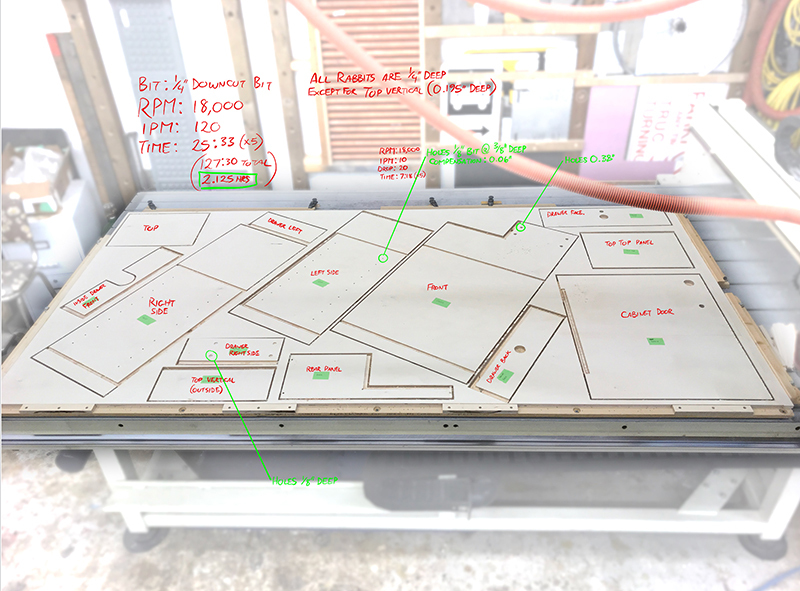 The process meant that measurements had to be done manually, but also that photographs had to be scaled, brought into software and then laid out for their CNC machine. 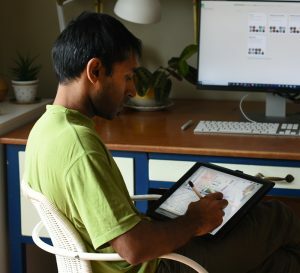 “At this point,” says Morbi, “photographing things and applying measurements on a portable tablet is useful because you can show it to the client and kind of have the concept bounce back and forth on-site, until it’s exactly what they want. Luckily for Morbi and Reain, the cost of the downtown real estate squeeze hasn’t caught up with them yet, with the location providing benefits that shops in the suburbs aren’t likely to experience. 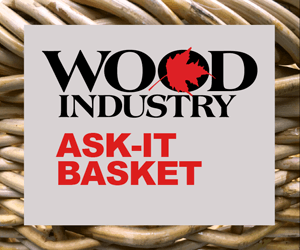 An across-the-alleyway interior design firm neighbour now does business with them.